This collection . . . is a great illustration of how, when the appropriate subject is chosen, no one on earth can say it better than the subject himself. Impressively thorough . . . and highly recommended. [The] book does such a good job of capturing the ticking inner workings of both the man and the artist that, at the end of the day, Springsteen on Springsteen cements itself as the one Boss book you’d have to take with you to a desert island. [This] brilliant new book, Springsteen on Springsteen, reprints the best interviews, going back to 1973. Until the boss writes an autobiography, this is the next-closest thing . . . It’s a superb collection. This [book] was more than a pleasant surprise. It was a mini-revelation…You really do feel like you know Bruce after you finish this book. Springsteen on Springsteen shows “the reader something that a more traditional biography could not typically accomplish . . . Burger, having picked such an articulate subject, offers just the right amount of context to open each piece . 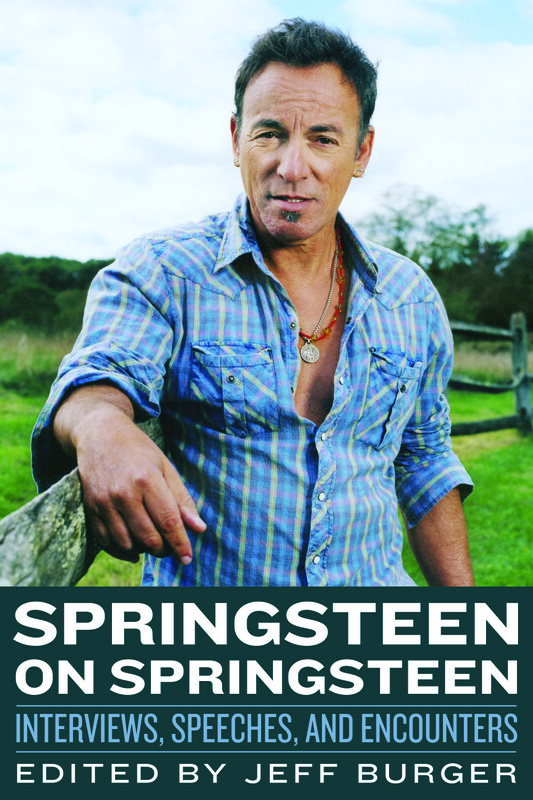 . . A fun and light read [that is also] a boon to any serious Springsteen scholar. This book follows the artist from his humble start as a struggling artist to rock god, but lets him tell the story in his own words. If you are looking to learn more about the man behind the music, [this book] is the place to go . . . Burger gives the reader the historical accuracy and background desired by pop culture academics like myself, while also whetting the appetite of those Springsteenopiles looking to learn more about his life straight from the horse’s mouth. What Burger achieves is . . . impressive. He presents an eclectic cross-section of interviews, but does more than just choose random pieces. There is a natural flow, and he also provides extensive editor’s notes to correct fact errors that popped up in the original interviews. His introductions to each chapter are crisp and give the proper context so the reader can understand the mindset of both Springsteen and the interviewer . . . This collection tells plenty about Bruce Springsteen — the man, not the myth. What makes Springsteen on Springsteen different—and worthy—is that it’s one of the few tomes that mostly lets the artist speak for himself . . . The reader can grasp the growth of Springsteen and his worldview as his career takes off . . . [This book] is definitely worth making room for on the Boss bookshelf. Bruce Springsteen has been interviewed around the world on radio and television and by newspapers, fanzines, and general-interest and music magazines. Many of his most engrossing conversations are housed in this book. Fans should welcome this valuable collection. I know I do. Beginning with his first interviews in 1973 and arcing like one of his songs through every subsequent high and low . . . consider this the printed equivalent of the subject’s sprawling Live/1975–85 collection: pure and unfettered. A great collection. The only other way to experience this much of Springsteen’s ‘voice’ is to see him in concert. Springsteen on Springsteen is a fine and necessary addition to the literature on this incredible artist, performer, and man. A must for any Springsteen lover as it has so much—not only a wide range of interviews in all media, here and overseas, but a collection of beautiful speeches written and delivered by the Boss over the years. Journalist-author Jeff Burger’s love of the subject comes across in this vast profusion of unexpected material he’s discovered, allowing the reader to view Springsteen from many angles, and over the decades . . . A remarkable journey across the arc of a singular career—sometimes harrowing, ultimately heroic, revealing a tremendous strength of character as the Boss stayed true to his ideals, even in the face of what he calls ‘catastrophic success.’ A great read about a genuine American hero. If you’re hungry to learn about the true soul of this remarkable man, look no further: it’s all here. Painstakingly edited…as close as we’re likely to get to a Bruce memoir anytime soon. The book, with its well-chosen interview entries from frequently obscure but potent sources, adds up to as good and revealing a biography of this unique figure—a step-by-step autobiography, in effect—as there’s been. The book features…the largest number of transcribed speeches published so far under one cover. Over the decades, Springsteen has given a smattering of interviews, many of the best of which are collected in…Springsteen on Springsteen. The book serves as testimony to Springsteen’s personal and intellectual growth from relatively unschooled, unsophisticated youth to articulate spokesman for serious causes and his own art. This ultimate Bruce Springsteen book is a compilation of the best Springsteen moments throughout his career collected from magazine, television, and newspaper interviews. Reviews are in and many are praising Burger for really finding Springsteen’s voice and collecting Springsteen’s most engrossing interviews. [The book] reveals a more intimate side of the artist that many fans never knew existed . . . Springsteen shares his views on everything from his lonely start to his current life. The result is a look at the artist in his own words that proves he is as articulate and provocative in interviews as he is in music. [Burger] has collected a treasure trove of Springsteen in the public eye . . . Bruce’s fans will likely read this book, seriously, nine, maybe 10 times . . . There are over 400 pages of interviews with the man and all of them are in-depth and well done. This is Bruce’s Greatest Interview Hits, if you will. Burger has captured the heart, soul and essence of Bruce Springsteen by stripping away the rock superstar’s public veneer and replacing it with first-person interviews . . . If you seek to know more about what’s inside the man, how he feels about his life, and how he has looked at the world at large across the landscape of his career, this book delivers that and more . . . This book is indeed a must-buy item. An engrossing collection . . . Even as a casual Bruce Springsteen fan, I find it fascinating to read [his] own words about himself and his music. [Springsteen on Springsteen] brings together many of the artist’s thoughts on a host of subjects ranging from the genesis of certain songs to the importance of punk rock to sustaining love and the necessity for gay marriage. It’s a smartly edited book that digs up early interviews from the ’70s through the late ’00s. It charts the maturation of a musician and a man as Springsteen develops while his answers to questions become more detailed, involving, and revealing. Springsteen on Springsteen is a document valuable for tracing his evolution from talented East Coast street kid to elder statesman of rock. One of the strengths of this book is that editor Burger didn’t just collect old interviews; he also contacted the interviwers and asked for any background stories or years-later comments they may have . . . Springsteen on Springsteen not only traces the career of a songwriter; it chronicles the development of a thinker . . . In assembling these interviews spanning nearly four decades Jeff Burger helps us to build a complex, evolving portrait of a performer, of a human being who grew into being the boss of his own mind. Springsteen on Springsteen . . . is a fascinating portrait of a remarkably thoughtful and unusually earnest artist who has consistently kept faith with his most demanding fans. The book is a fascinating time warp that takes readers not only through the changing attitudes of the artist, but through the changing attitudes of the time periods those conversations took place within. Also fascinating are the attitudes that don’t change—the perspectives that remain pure and truly at the core of Springsteen. [Springsteen is a] communicative interviewee who rarely gives bad copy . . . Burger has edited together a most enjoyable collection of writings which show a fascinating development of a struggling and jobbing musician into a major artist. What makes Burger’s book distinctive and valuable is that it includes a number of Springsteen’s own writings . . . Burger is also an assiduous editor who usefully and unobtrusively corrects the misstatements of his subjects and adds welcome brief contextual remarks in brackets. [Springsteen] has given tons of interviews throughout his half century as a musician. An excellent guide, revealed in 2013, Springsteen on Springsteen reprints the most effective interviews. Burger did plenty of sleuthing to track down rare interviews with Springsteen.